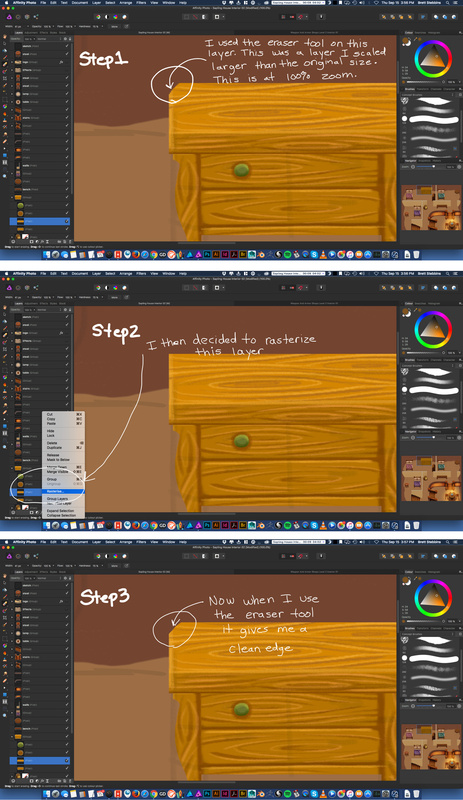 In Affinity Photo I have a pixel layer that I scaled up. I then used the eraser tool to erase part of the layer. The edge where I erased was pixelated looking at 100% zoom. It seems that when a pixel layer is scaled larger that the pixel size is also scaled larger. So, I decided to rasterize that layer. Then I used the eraser tool again. This time the edge where I erased was clean and smooth. I am assuming the rasterizing of the pixel layer set the pixels on the layer to the same size as the document resolution. Does this mean that every time I scale a pixel layer larger that I will have to rasterize it so that the pixels on that layer are set back to the same pixel size as the document resolution? This does not seem convenient. I would think that when a pixel layer is scaled up or down that the layer will adjust to the resolution of the document. I understand that an image layer would behave differently. I wasn't sure if this was a bug or not.